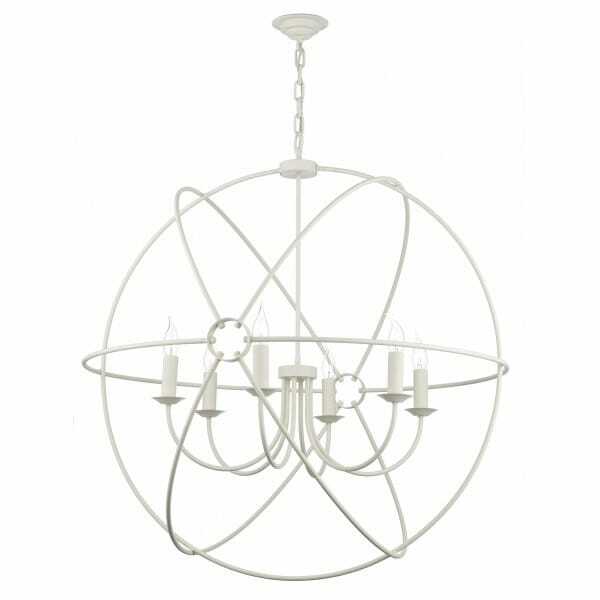 The large cream Orb ceiling pendant light designed and manufactured in the UK by David Hunt Lighting. A stunning, innovative design pendant based on a gyroscope. It makes a fantastic light for a high ceiling and would look stunning in an entrance hall, hanging in a barn conversion with a double height ceiling or in front of a large window. The unique design gives this light a different optical illusion from whichever angle it it viewed. The light is fixed to the ceiling on a cream rose and suspended on cream link chain to give a maximum drop of 150cms. Longer length chain can be supplied for lighting rooms with really high ceilings - please contact us if you would like to order this light with longer chain. The cream frame supports curved arms that carry the 6 candle style lights and the frame is surrounded by a series of thin cream hoops that create the gyroscope effect.